What’s included with our wedding marquee? The short answer to that question is, a lot! The marquee itself measures 9m x 15m, that’s big enough for 120 guests to eat. The marquee has a wall of clear panels so that guests get great views of the garden and the woods. If the weather’s warm, the walls can be opened so you’ve got an open sided space with protection from the sun. I’ve seen those transparent marquees which look amazing but if it’s a hot day, they’ll be like a green house. (Free tip: cooking your guests isn’t a good thing). If the weather’s wet our panels can be quickly closed to keep everyone warm and dry but your guests still get those great views. We’ve got a solid wooden floor that joins to the terrace with wide ramps so that no-one’s falling up (or down) any steps in the evening. No swirly hotel or cheap one-off event carpet here, ours is a hotel grade, cream carpet which we clean with our super industrial carpet cleaner after every wedding. 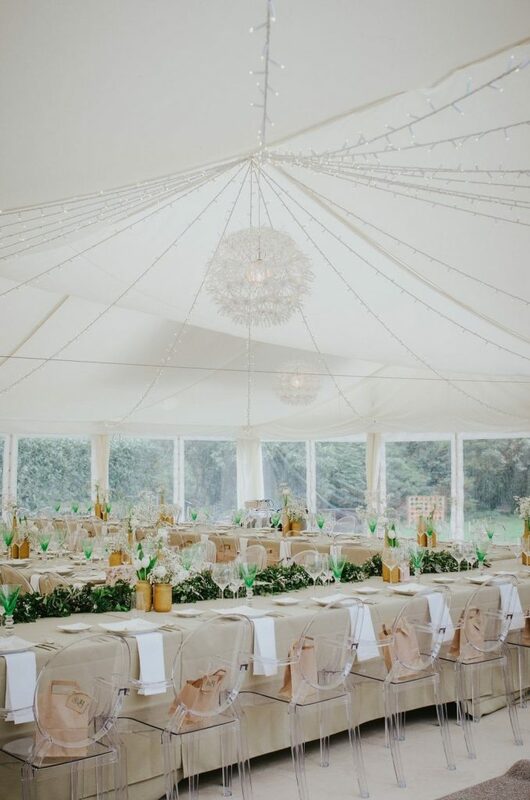 The marquee is fully lined with what are known in the marquee trade as ‘flat linings’, that means they’re not the ruched ones like victorian bloomers, they’re flat which give them a contemporary feel. We’ve got our own sound system with settings for a live band, DJ or a playlist, the huge speakers are attached to the marquee roof frame, underneath the linings. 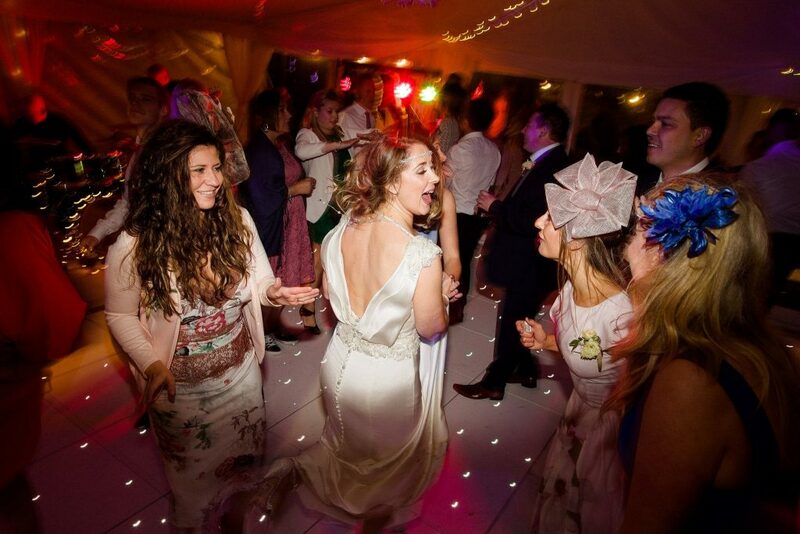 We include our super fab sparkly white led dance floor – everyone loves that! We provide a catering tent for the caterers to prepare and cook all the food. The catering tent is attached to the main marquee so waiting staff have easy and direct access for service. Lighting is sooo important for a beautiful wedding. In the evening the marquee is transformed into an enchanted place with fairy lights and candles. 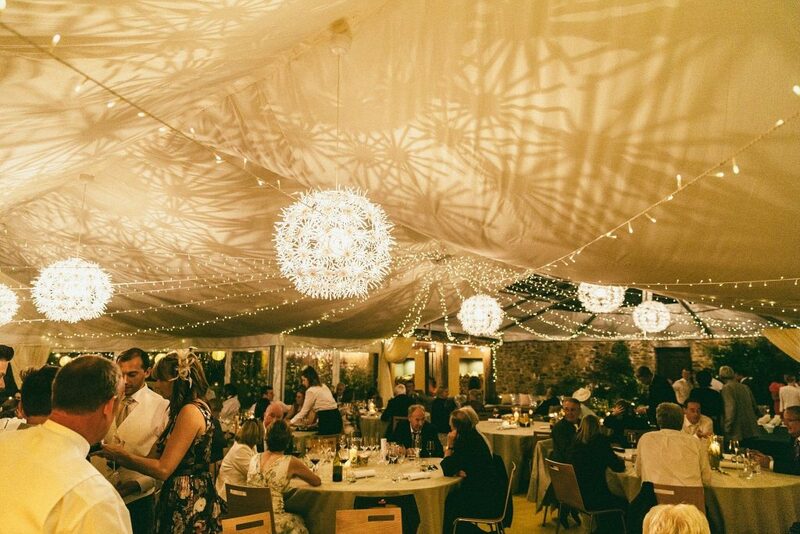 We supply a fairy light canopy throughout the whole marquee plus 4 dandelion pendant lights. All the lighting’s on dimmers so we can control the lighting as the evening goes on. We provide you with all the tables and chairs you need for eating. You’ve got a choice of round tables or long tables, you’ll see both options in photos on this post. Table linen is also included, a choice of 3 colours which fit perfectly with our natural colours vibe. Then a choice of wooden or ghost chairs. All included and all set up for you. 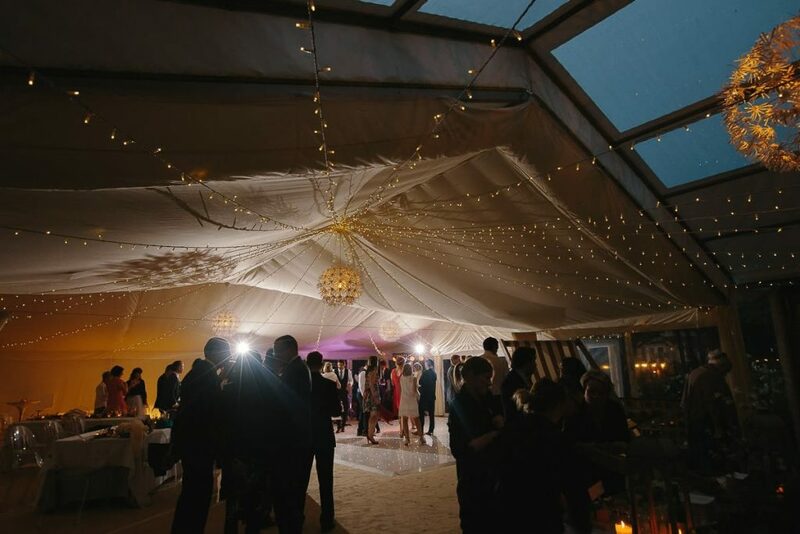 Not only do you get our bespoke marquee for your Ever After wedding, you also get the wedding barn for your wedding ceremony, the glass roof terrace for the evening (and wet weather drinks reception), gazebos at the top ponds for arrival drinks and of course the landscaped gardens and woods. See more marquee action in the gallery of our real weddings. If you’d like a copy of our summer wedding brochure, just click here.